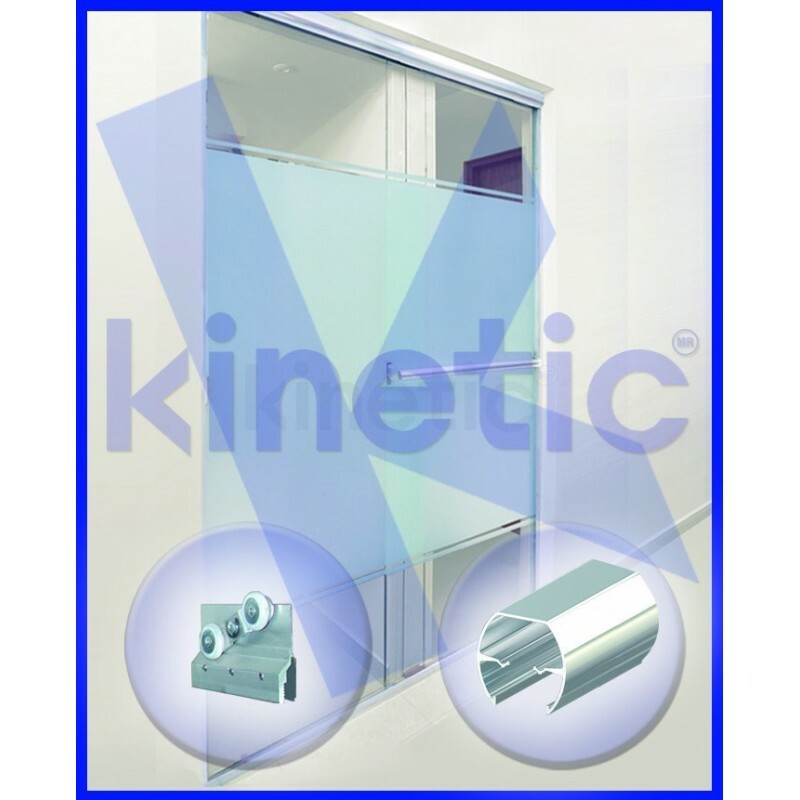 SLIDING SHOWER DOOR ROUND SLIDING DOOR TRACK DOUBLE ROLLER 2.03 X 1.875 M, WHITE PAINT FINISH - Kinetic, s.a. de c.v. Round sliding door track kit 2.03 x 1.875 M with double roller for monolithic tempered glass panels 5 to 6 mm width, white paint finish. Parts list: A) Floor rail, 1 piece; B) Side bars, 2 pieces; C) 1/4" peg, 6 pieces; D) Door stops, 4 pieces; E) Stainless steel flat head lag screws N8X1", 6 pieces; F) Top door track, 1 piece; G) Rollers, 4 pieces; I) Interior handles, 2 pieces; J) Arm, 2 pieces; K) Clip, 2 pieces; L) Towel bar 1 M, 1 piece; M) Short door panel guide, 2 pieces; N) Long door panel guide, 1 piece; O) Stainless steel flat head lag screw N6X1.5". Includes installation manual. Round sliding door track kit 2.03 x 1.875 M with double roller for monolithic tempered glass panels 5 to 6 mm width, white paint finish. Parts list: A) Floor rail, 1 piece; B) Side bars, 2 pieces; C) 1/4" peg, 6 pieces; D) Door stops, 4 pieces; E) Stainless steel flat head lag screws N8X1", 6 pieces; F) Top door track, 1 piece; G) Rollers, 4 pieces; I) Interior handles, 2 pieces; J) Arm, 2 pieces; K) Clip, 2 pieces; L) Towel bar 1 M, 1 piece; M) Short door panel guide, 2 pieces; N) Long door panel guide, 1 piece; O) Stainless steel flat head lag screw N6X1.5". Includes installation manual.